Microsoft had hinted that it didn&apos;t want to compete with the iPad based on price and now it&apos;s clear that it won&apos;t. The company&apos;s Surface tablet is available now for pre-order, and the least expensive configuration is selling for $499— the same price as Apple&apos;s device. The $499 version of Surface has 32 GB of storage, runs Windows 8 RT— the mobile version of the desktop OS— and does not include the much-anticipated Touch Cover. 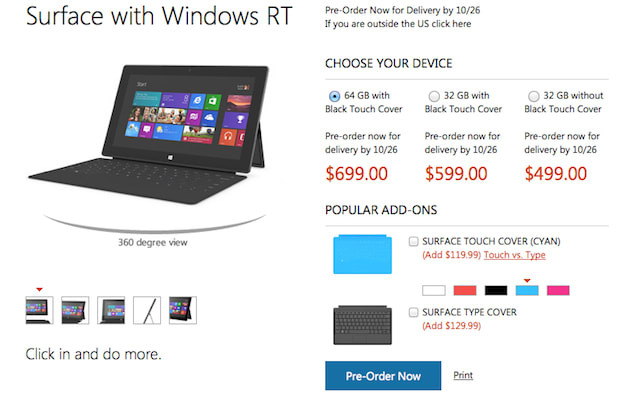 An identical $599 version and a 64 GB $699 version do include the Touch Cover, but strangely only in black. As of now, all models of Surface are wifi-only and a promised "professional" model that will run the full version of Windows 8 has not yet been announced. Additionaly Touch Covers, a requirement if you want anything other than black, cost $119— a high price to pay for style. The force-feedback Type Cover goes for $129 and is exclusively available in black. Microsoft says pre-orders made now will ship by the 26th. What do you guys think? Is Surface worth the dough? Are Touch Covers too expensive? Which model would you get?